Yesterday I spent the day working on Satori’s mast. 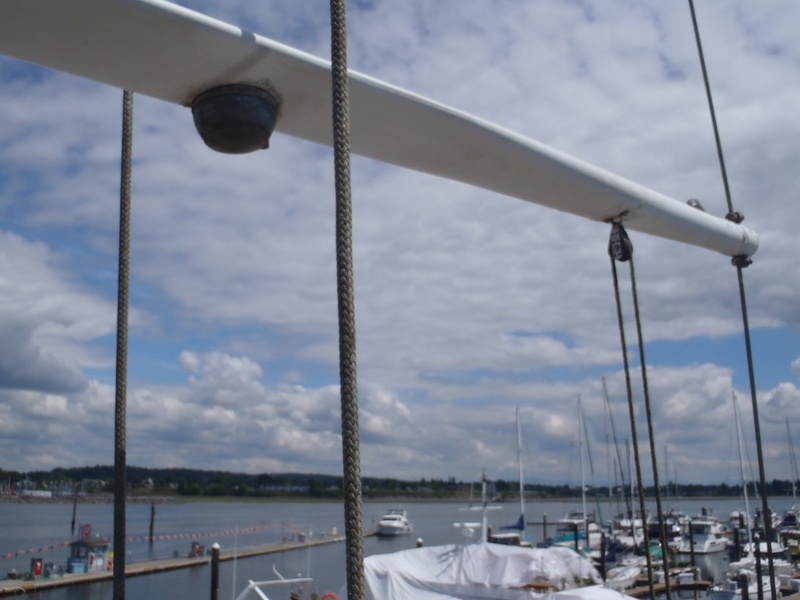 I have been wondering where to mount a trysail, not realizing that the mast has two tracks facing aft (secondary is slightly offset, primary is where the mainsail goes). The secondary track does indeed exist so I’m ordering a trysail in the future for offshore severe weather preparation. 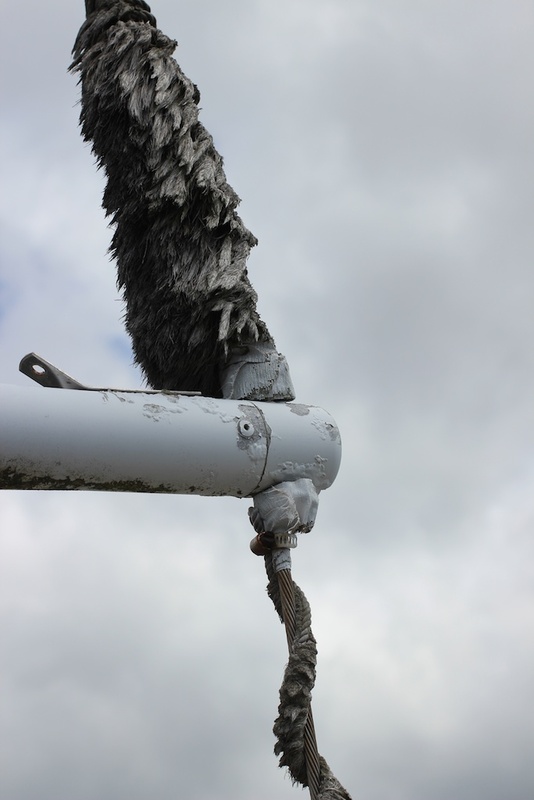 Also it seems that Satori came with equipment to climb the mast using a long etrier. 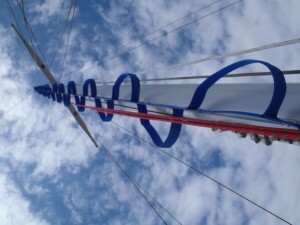 I’m familiar with ertiers in climbing and so it makes sense that this style of ladder is used for mast climbing. Essentially you have a rung for each foot and you can either grab the main center web or a rung for hand holds. I used a climbing harness and daisy chains with locking carabiners to anchor myself so I could hang from my harness to be hands-free. 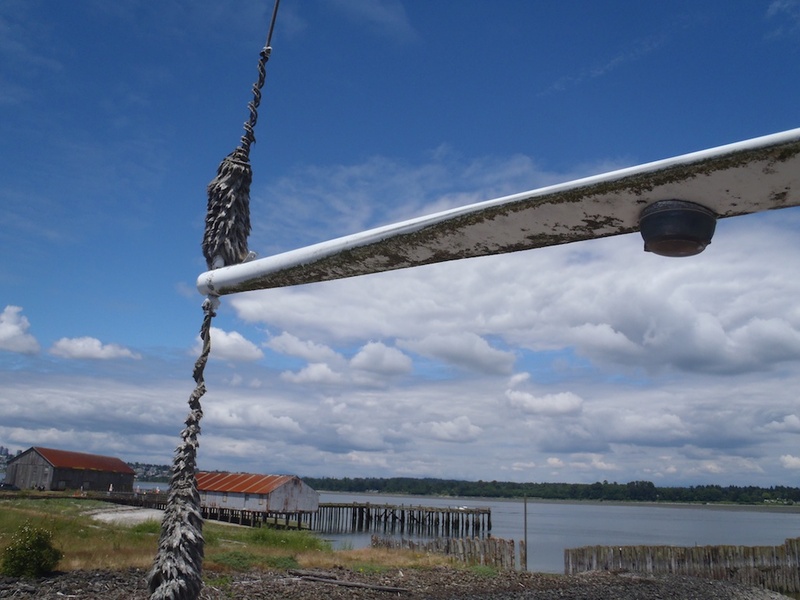 Another safety precaution that proved handy was to use a Petzl tibloc clipped to a second daisy chain that ran up and down an anchored halyard. This allows me to move up but if for any reason I fall the ascender will catch me. 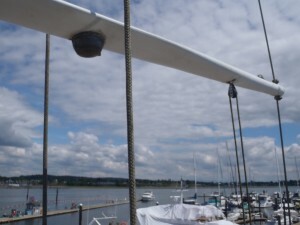 To go down I simply position the tibloc so it will run freely down the halyard. The only issue with the tibloc is that it is a little sticky for going down. The Petzl basic has a trigger that allows the ascender to move down much easier and would be better for those who want an easier solution. Mast Mate etrier mast ladder uses mast slugs to raise into the secondary sail track. 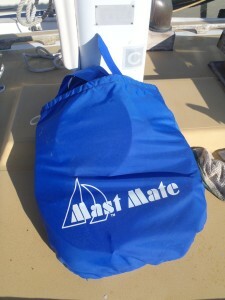 Mast Mate packages and stows very compact. A very nice accessory for mast climbing. 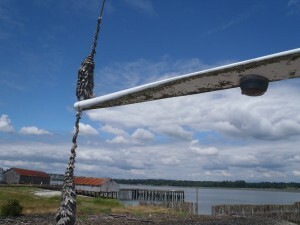 I have been working with Kent Morrow of Northwest Rigging in Anacortes to assist me in self servicing the standing rigging in several stages. I removed the lower shrouds and dropped them by their shop to have replaced. To keep the exact same position of the lock nuts on the turnbuckle I simply marked the threads with a sharpie and then marked which shroud goes where with three indicators; port/starboard,front/rear and bottom. I’m a bit weary of replacing the fore and aft stays since I’ve never worked on sailboat rigging before. Hopefully it’s easier than I’m imagining and I can do the entire replacement on my own. 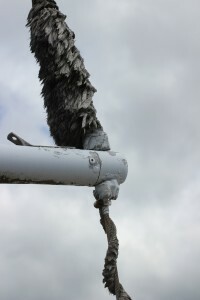 The other item on the todo list was to clean the spreaders and remove the nasty looking fuzzy spreader anti-chafe things. There was a gob of tape wrapped around the clamps that hold the spreaders in place on the upper shrouds but I decided to remove it all and clean the spreaders. I will buy a pair of spreader boots to solve the chafe problem and install them when I replace the upper shrouds.